Everybody appreciates a unique, handmade, one of a kind gift. 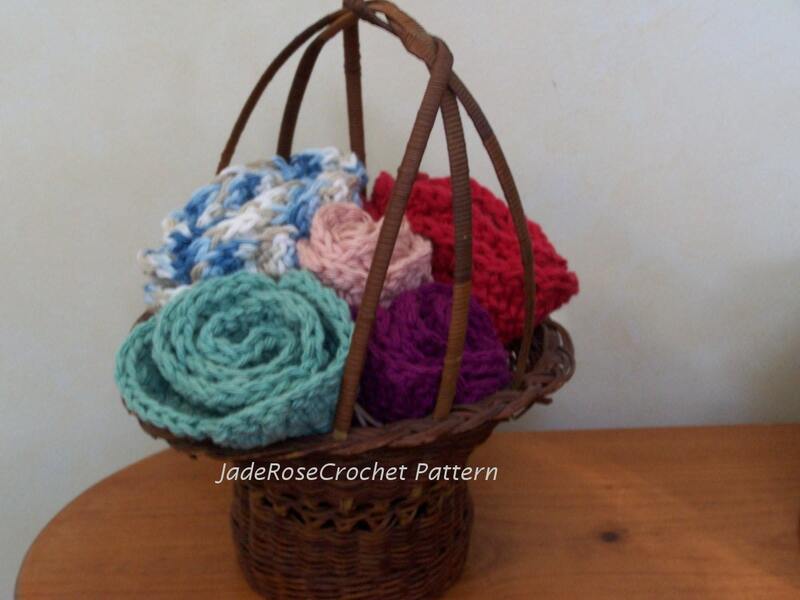 When presented in a basket, this fun crochet pattern becomes a bouquet of cloths for your next wedding or baby shower. Great for the environment and pretty as well. I made a few dishcloths and realized I was grabbing them for quick potholders or pretty trivets for candles and flower pots. And then I thought that they looked pretty in the bathroom, and were much cheaper than store bought washcloths. The small one is 4.5 inches in diameter - perfect for a mug rug or coaster for your bar. This original pattern provides easy instructions for the beginner. All you need to know is slip stitch, single crochet, double crochet, and treble crochet. Finished sizes are 4.5, 7, and 8 inches in diameter. "Thanks so much, love how they look"
" friendly seller. Patterns seem easy to read - thank you!" "easy pattern, so versatile too!" I love the pattern, just what I was looking for. Quick and easy download. Thanks.